There are two styles of gouache that I have worked with. One has chalk added to make it more opaque. This is really lovely to work with fresh from the tube, but doesn't re-wet well. added when filling (always bit by bit) - you can see some cracking in the colours along the left side. 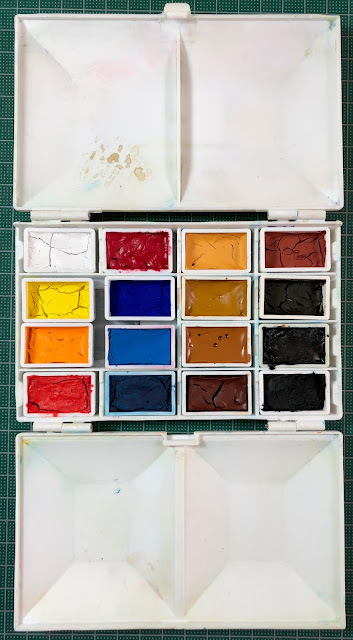 M.Graham here and painted out here, Schmincke here the Zorn palette here and a photo of a swatch of my gouache palette here. I will update these individual swatches, but I think it is more helpful to have them altogether. I had some old gouache from the 1990s - some with no numbers or pigment information so I've included those too. 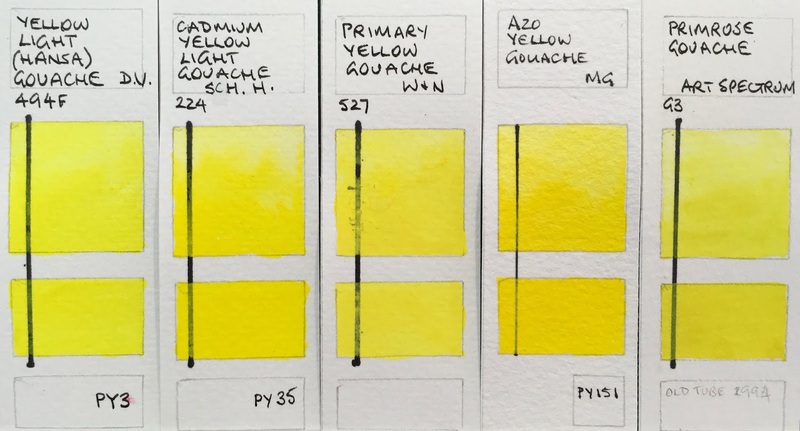 I used a 6 colour plus black and white set in the Art Spectrum range to create a whole range of colour charts and wheels here, but the Black and White, Deep Yellow, Ultramarine and Vermilion I used have long since dried up so I haven't included a sample of those. Here are the various tube sizes - the Da Vinci 37ml tubes are enormous! The others range from 14ml for the W&N, 15ml for the Schmincke Horadam, the M.Graham and the smaller Da Vinci, and 22.5 ml for the Art Spectrum. 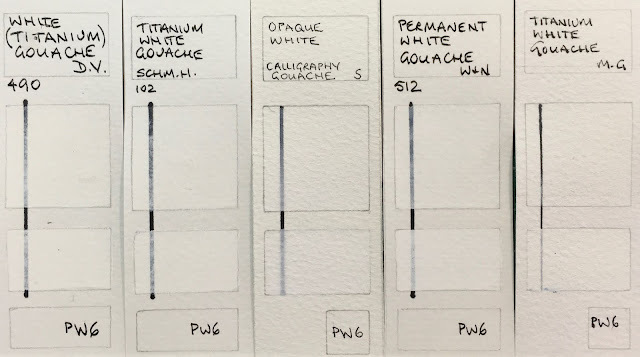 White Gouache - Titanium White Da Vinci) Titanium White Schmincke, Opaque White Schmincke, Permanent White Winsor & Newton, titanium White M.Graham. 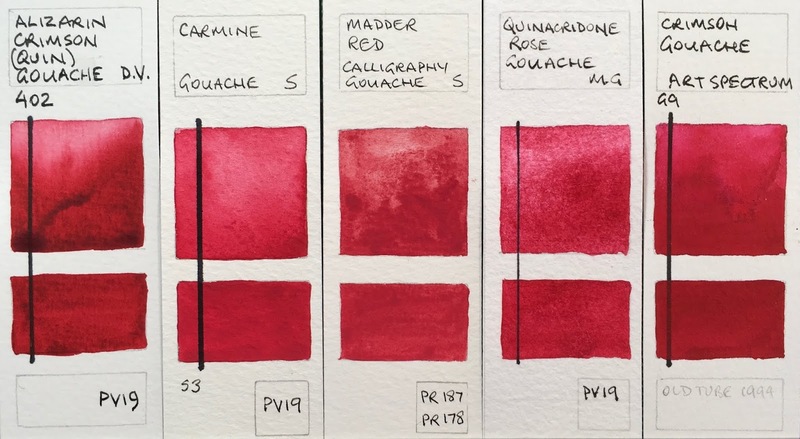 Cadmium pigments made a whole lot of sense if you want opaque colours without additives, but they are expensive. Cool and mid yellow Gouache - Hansa Yellow Light Da Vinci, Cadmium Yellow Light Schmincke, Primary Yellow Winsor & Newton, Azo Yellow M.Graham, Primrose Art Spectrum. 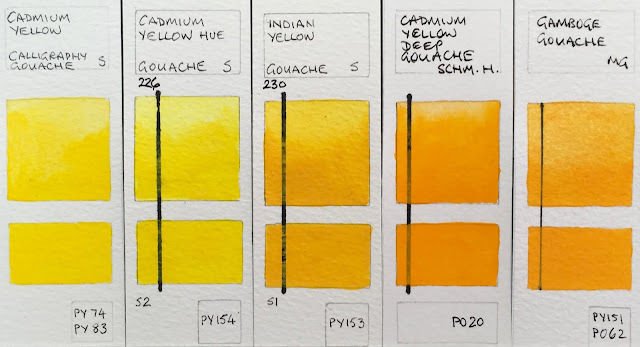 Mid to warm yellow Gouache - Cadmium Yellow Schmincke, Cadmium Yellow Hue Schmicnke, Indian Yellow Schmincke, Cadmium Yellow Deep Schmincke, Gamboge M.Graham. I really love the pigment PR255 as a warm red. 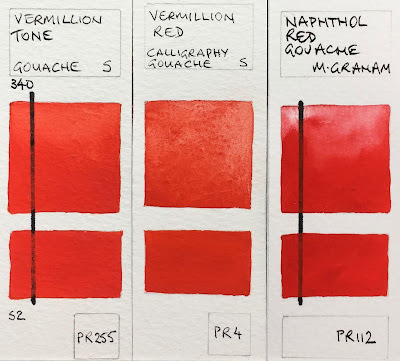 It's probably not as opaque as a cadmium red woudl be but it is a gorgeous colour. Cool red Gouache - Alizarin Crimson (Quin) Da Vinci, Carmine Schmincke, Madder Red Schmincke, Quinacriodone Rose M.Graham, Crimson Art Spectrum. I really love the pigment PR255 as a warm red. 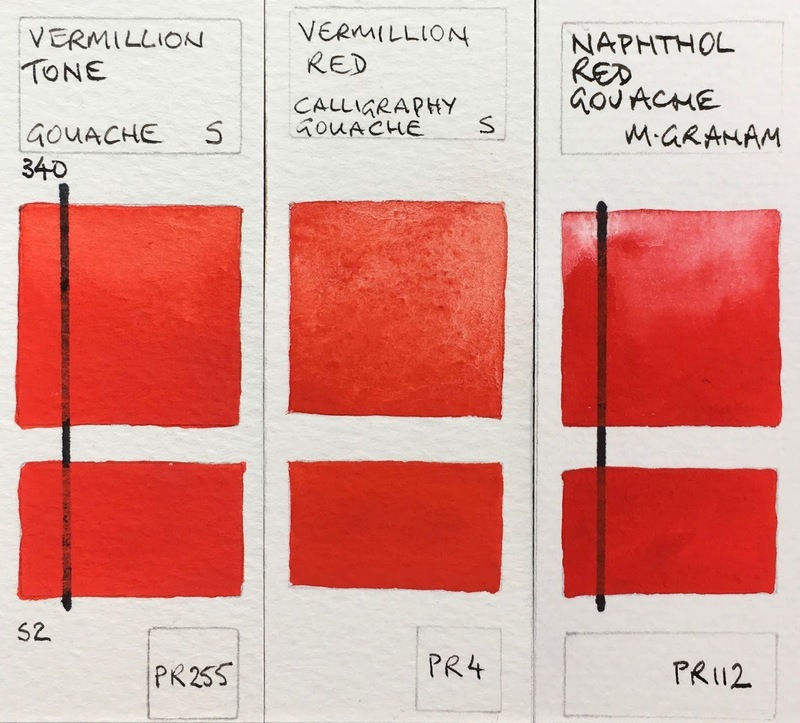 It's probably not as opaque as a cadmium scarlet would be but it's gorgeous. 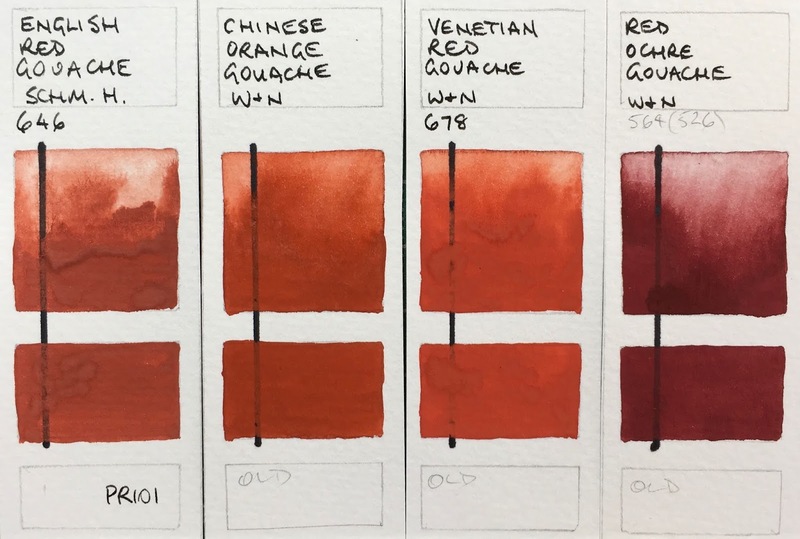 Warm Red Gouage - Vermillion Tone Schmcinke, Vermillion Red Schmincke, Naphthol Red M.Graham. 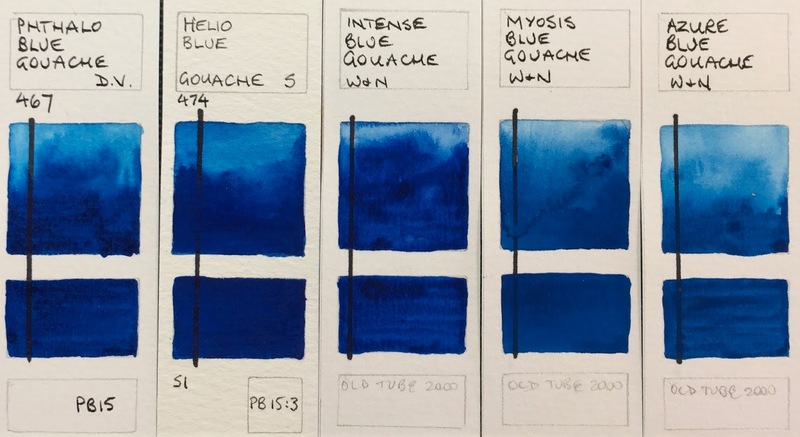 I like the depth of the Schmincke Ultramarine Deep, but these are all nice to paint with. 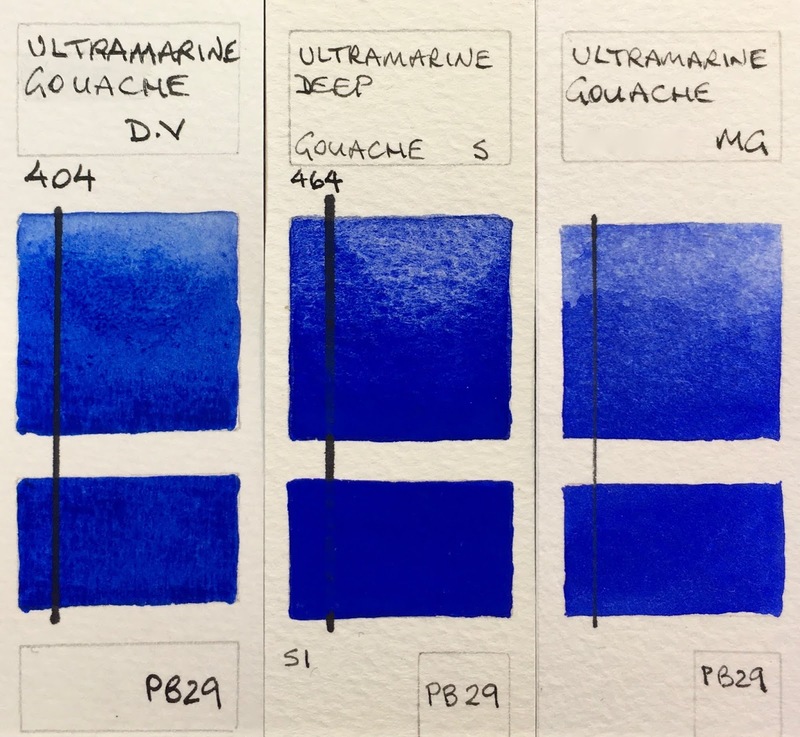 Ultramarine Gouache - Ultramarine Da Vinci, Ultramarine Deep Schmincke, Ultramarine M.Graham. Phthalo pigments are not opaque. Good for tinting other colours though. 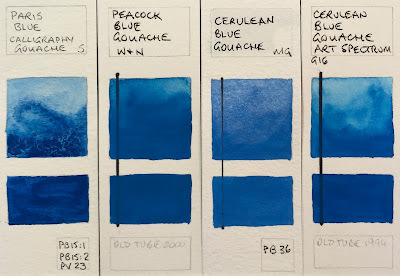 Cool blue Gouache - Phthalo Blue Da Vinci, Helio Blue Schmincke, Intense Blue Winsor & Newton, Myosis Blue, Winsor & Newton, Asure Blue Winsor & Newton. 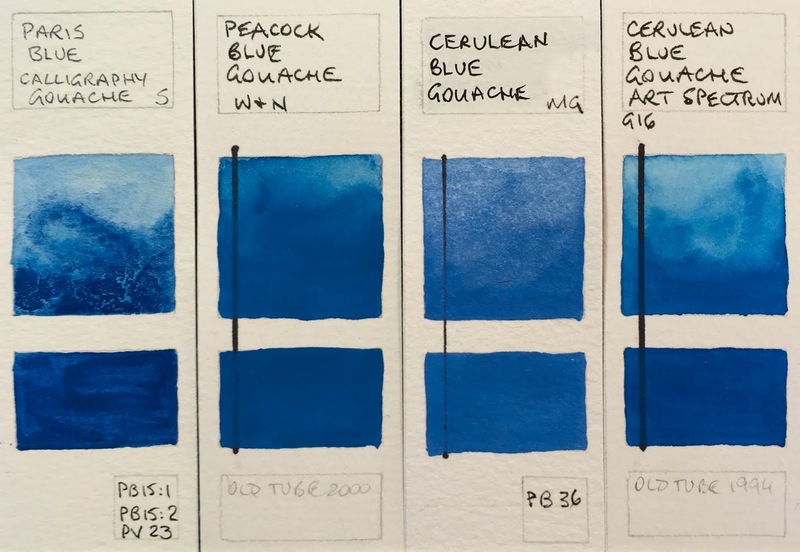 I think the Art Spectrum was a genuine cerulean pigment but the M.Graham certainly is. This is a lovely turquoise colour. I don't use it much but it is a little more opaque than the phthalos and can be used to neutralise a warm red, or to mix greens with the yellows. 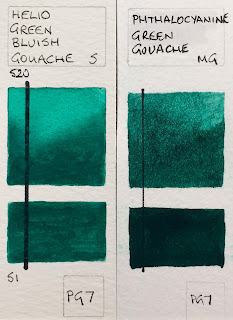 Turquoise Gouache - Helio Turquoise Schmincke. Phthalo green is usually a transparent pigment. 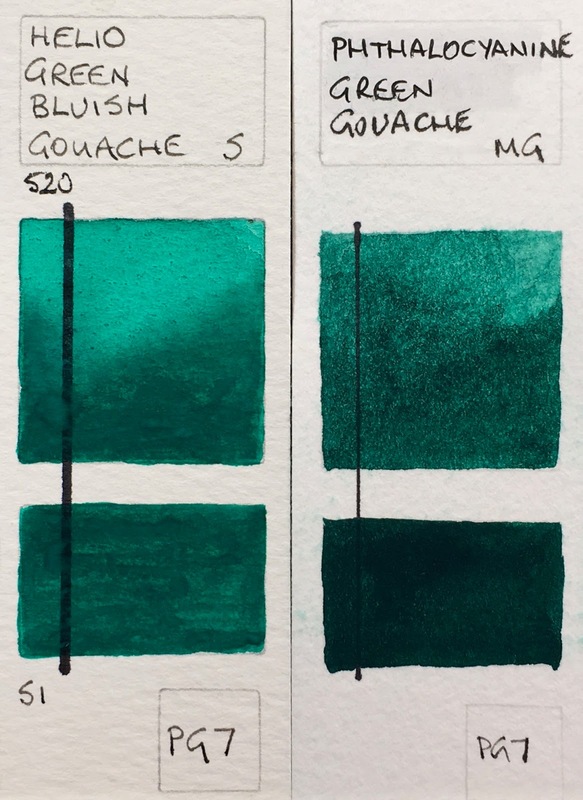 Green Gouache - Helio Green Bluish Schmincke, Phthalocyaninie Green M.Graham. I really like PBr24 but only have it in my gouache palette. 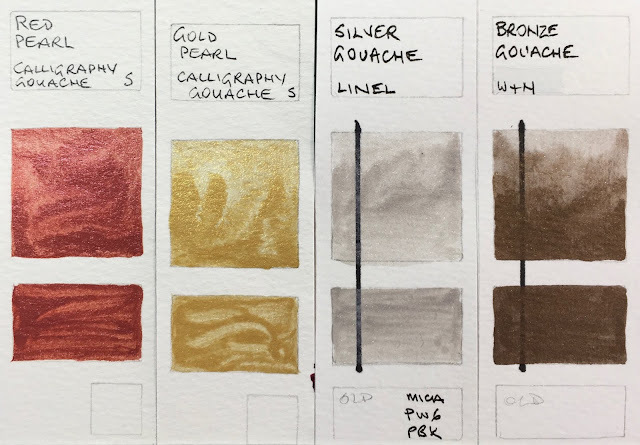 Gouache - Naples Yellow Winsor & Newton, Titanium Gold Ochre Schmincke. 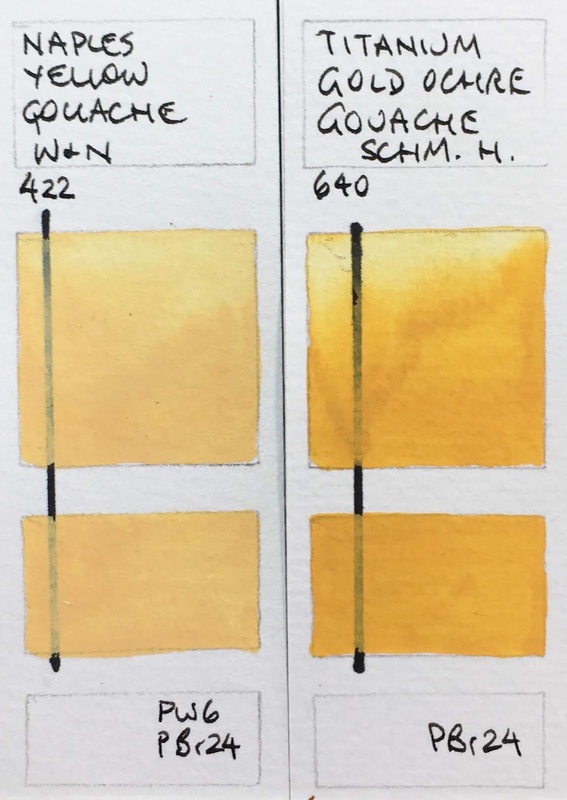 The Da Vinci Yellow Ochre is just lovely. Yellow ochre Gouache - Yellow Ochre Da Vinci, Yellow Ochre Winsor & Newton. Raw Sienna Gouache - Raw Sienna Winsor & Newton, Raw Sienna M.Graham, Raw Sienna Da Vinci, Raw Sienna Schmincke. 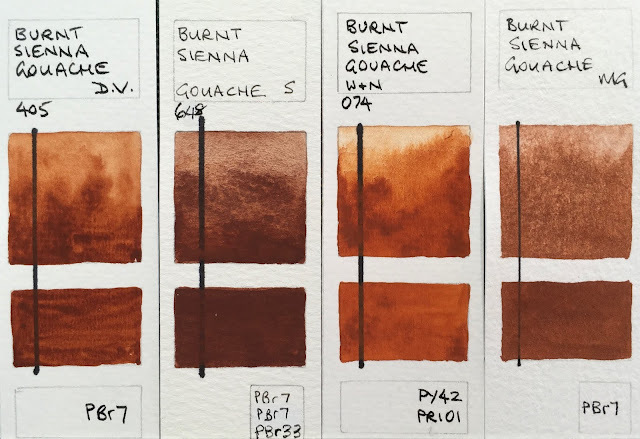 Burnt Sienna Gouache - Burnt Sienna Da Vinci, Burnt Sienna Schmincke, Burnt Sienna Winsor & Newton, Burnt Sienna M.Graham. Red earth Gouache - English Red Schmincke, Chinese Orange Winsor & Newton, Venetian Red Winsor & Newton, Red Ochre Winsor & Newton. 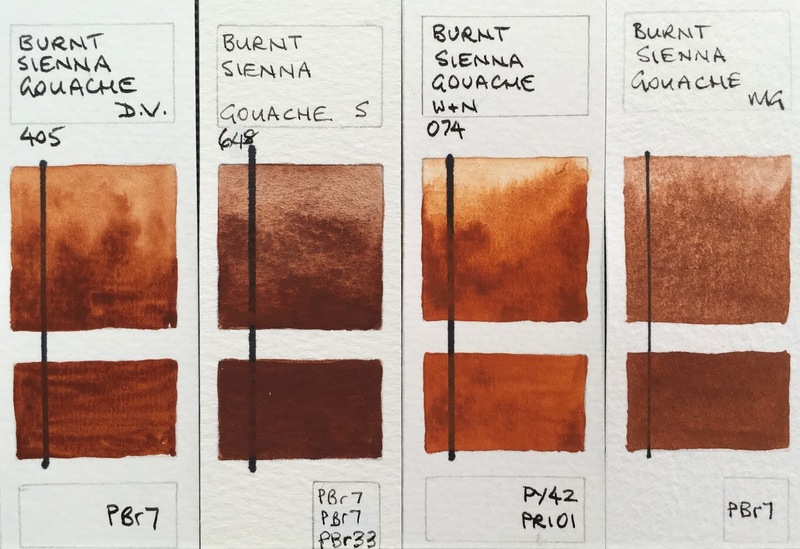 The Da Vinci Raw Umber is a lovely deep cool brown. 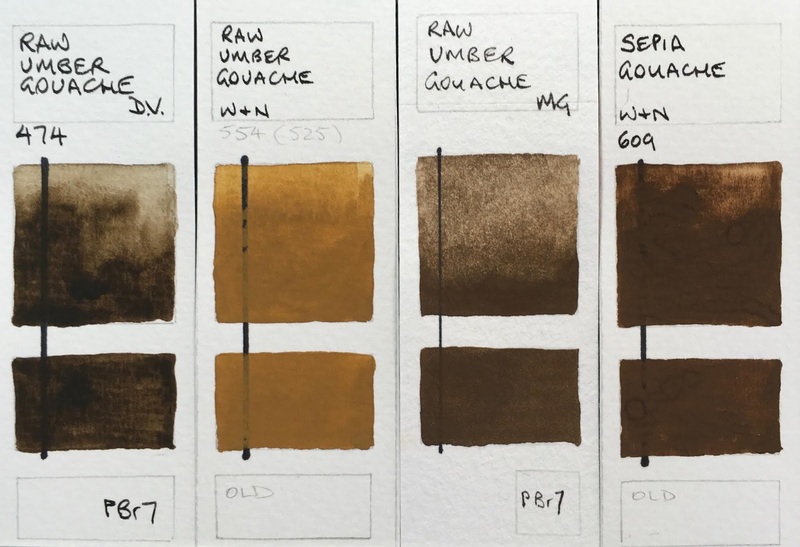 Dark brown Gouache - Raw Umber Da Vinci, Raw Umber Winsor & Newton, Raw Umber M.Graham, Sepia Winsor & Newton. 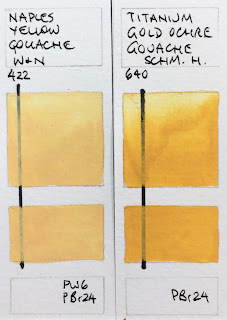 Schmincke Neutral Grey gouache, like their watercolour, is made from coloured pigments not black or white. I really like that :-). The Winsor & Newton tubes predate pigment information. Grey Gouache - Neutral Grey Schmincke, Grey No 1 (Light) Winsor & Newton, Grey No 2 Winsor & Newton, Grey No 3, Winsor & Newton, Grey No 4 Winsor & Newton, Grey No 5 (Dark) Winsor & Newton. I liked the Schmincke best in this range, though I tend to use the grey above. 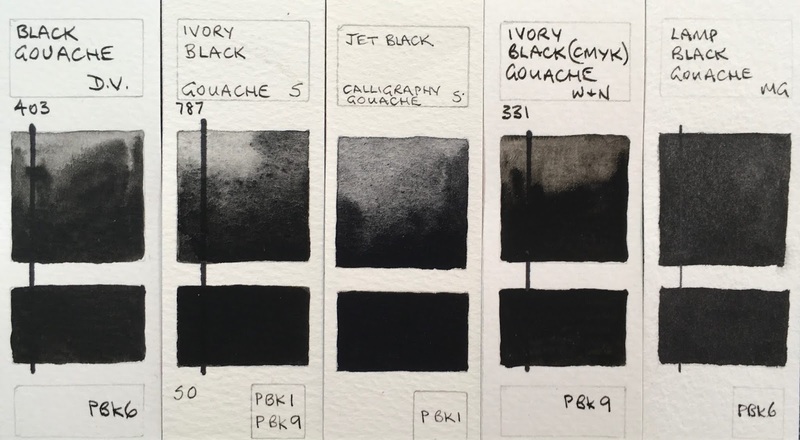 Black Gouache - Black Da Vinci, Ivory Black Schmincke, Jet Black Schmincke, Ivory Black CMYK Winsor & Newton, Lamp Black M.Graham. I use some sparkly colours for calligraphy, not for painting. 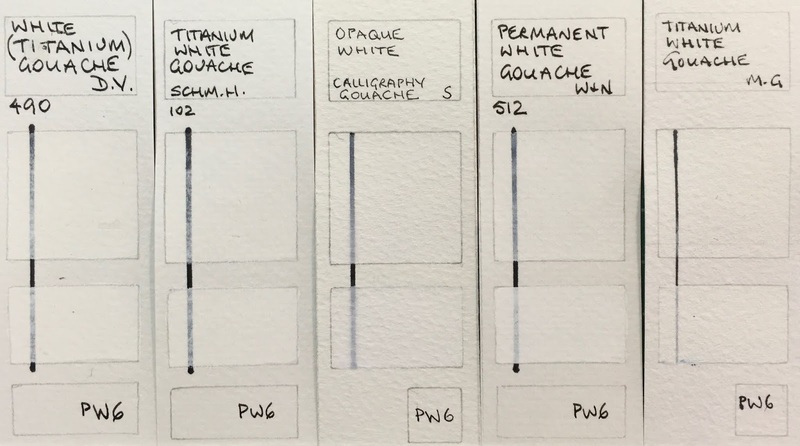 The Silver and Bronze are very old tubes. Metallic Gouache - Red Pearl Schmincke, Gold Pearl Schmincke, Silver Linel, Bronze Winsor & Newton. 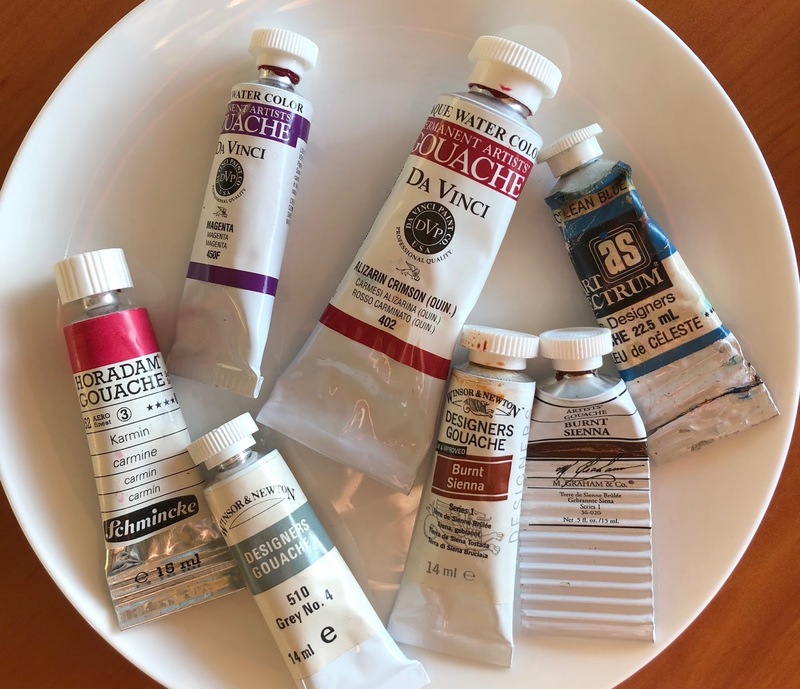 Between M. Graham, Schmincke and Da Vinci, do you have any preference in general or is this a preference of a single color over another depending on the brand? 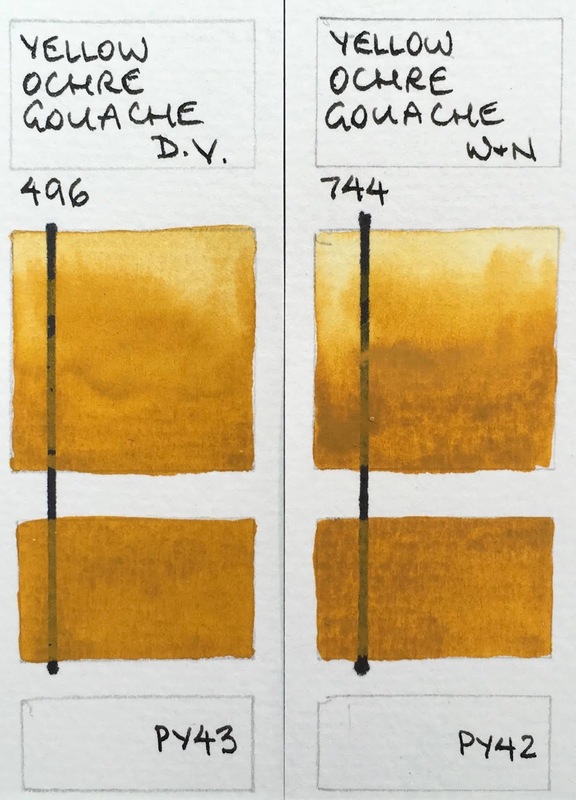 BTW have you seen the new Da Vinci Series 499 Traditional wash brush Size 3 with Ethergraf ® Metalpoint tip? I have one and I think I love it. The brush is just the right size, I can sketch with the tip and it's small enough to fit in my travel gear. Both SAA and Jackson's in the UK have them. As I was looking for the most opaque versions of a range of colours, and single pigment where possible, I’ve ended up with mostly Schmincke, some Da Vinci and one M.Graham, I can add the details if that’s of interest. I’ve seen that gorgeous brush and it’s on my radar. Nearly bought in in Porto but decided it was bigger than I really needed but it’s so desirable. They have another version with the silver top in a fertile style too. Such excellent brushes! As far as I'm concerned, the only brands that make gouache in the form of hyperconcentrated watercolors (or as what I regard as the premium-grade) and without the addition of whiteners are: Holbein, WN, Schmincke Horadam, & M. 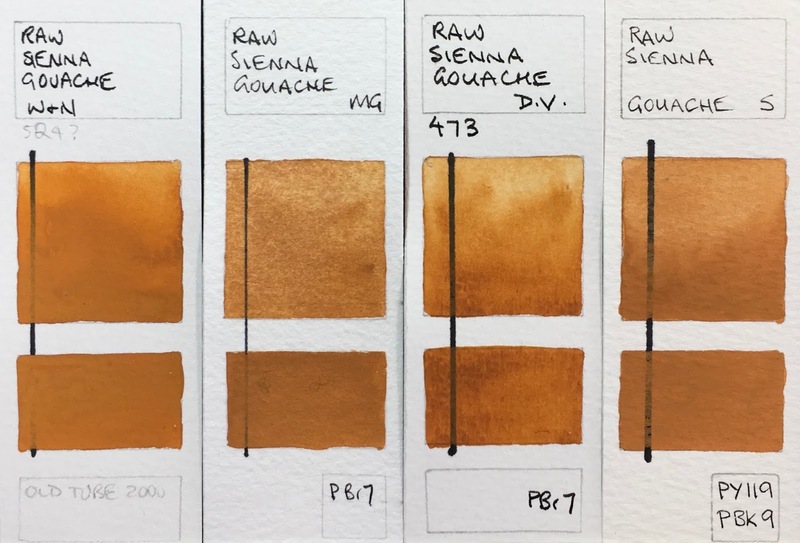 Graham...I don't know about Da Vinci, but the 4 mentioned above definitely use the same mineral pigments as in their professional watercolor range. Personally, Holbein is the best for my style (it doesn't crack as easily as WN when applied very thickly), although to be fair, only these 2 brands are presently available at art supplies shops here in the Philippines (Schmincke Horadam and M. Graham were only available online). What palette are you keeping the Gouache in? It is called a Herring Compact and this is the full pan version (there is also a half pan version), with the thumb hole filled in. Available from the UK from Jacksons.com and Ken Bromley. ShinHan PWC Watercolours - full 104 colour range. 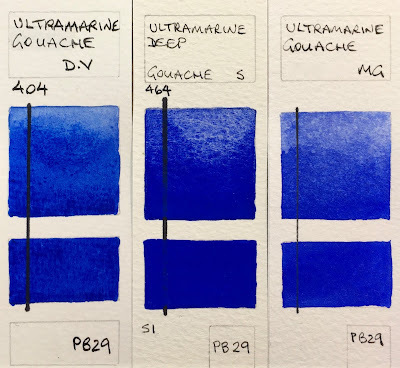 De Atramentis Document Inks Revisited.